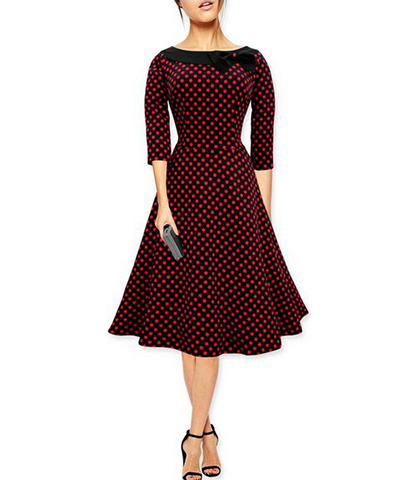 A wide bow collar and a wide boat neckline make great features for this retro styled dress which was worn by the popular American movie star in the 1950s, Audrey Hepburn. Large polka dots add fun and glamour for this dress, which harkens back to a simpler style in clothing which is returning in today’s fashion market. Elbow length sleeves draw attention to the trim waist and simple, a-line skirt which flairs around your knees. A rear zipper closure finishes off the special features for this fine garment that you will love to wear. Small size; bust 88, waist 70, sleeve length 45, shoulder 34 cm, total length 108 cm.